A laser peel is performed by using a CO2 or Erbium laser, which is capable of delivering short bursts of energy. By focusing the laser on the surface of the skin, it is possible to remove wrinkles, scars and many other skin blemishes without leaving a scar. The advantages of the laser are that there is no need for hospitalisation or general anaesthesia. Facelifts only help with folds and sagging skin. A facelift does nothing for the wrinkles on the upper lip, bridge of the nose, frown area, eyelid, forehead and most areas of the chin. A laser peel of the upper lip takes a few minutes while an entire face can take up to an hour depending on the degree of wrinkling. The peel has a favourable benefit-to-risk ratio and has the lowest risk than of other procedures to remove wrinkles. The advantages of the Erbium YAG laser over the CO2 laser has less pain during the procedure so less need for sedation and injections. The healing time is also quicker taking less than a week. 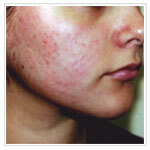 However deeper wrinkles and acne scars are not removed as effectively and the CO2 laser is superior in that regard. How long does a laser peel take? A laser peel of the upper lip takes a few minutes. To do the whole face generally takes thirty minutes to several hours, depending on the anaesthetic, and the severity of the wrinkles or scars. Pain medication, sedatives, or local or general anaesthetics are usually given to make the procedure comfortable. After the laser peel there is very little pain for most patients. How can I prepare for a laser peel? What do I look like while my skin is healing? During the recovery period following a laser peel, there will be some oozing and swelling of the skin for a few days. A dressing or ointments are usually applied to the skin to prevent crusting and scabbing. The skin will gradually heal within 14 days. About 2 weeks after the laser peel, the skin will still be pink and smooth. Makeup may be used at this time. Strict sun avoidance is necessary until the pink discolouration disappears. There are creams that can be used to help heal and protect the skin. Glycolic-acid products or Retin-A, can usually be restarted a few weeks after a laser peel has healed. A natural, purified protein that that relaxes wrinkle causing muscles is an innovation in non-invasive facial enhancement that targets moderate to deep wrinkles. This creates a smoothed, rejuvenated and more youthful appearance. It's a simple non surgical procedure that smoothes the deep persistent facial lines that develop over time. One ten minute treatment-a few tiny injections-relaxes the muscles that cause those lines to form and keeps them relaxed for months. This procedure is for varicose and spider veins on the legs which may develop following pregnancy or as a consequence of heredity. Excellent results are achieved with this procedure. The advantages are that no surgery is required and it is a walk in walk out treatment lasting about 30 minutes. Facial lines are caused, among other factors, the gradual loss of collagen and hyaluronic acid, proteins that form the framework of our skin. Every year more collagen naturally disappears and the skin above it settles leaving lines and furrows. Replacement Therapy can actually replenish the skin's lost collagen, filling out the lines and furrows and giving younger, softer skin. The skin creates volume, resulting in a healthy vital appearance. There are many type of cosmetic injections that can range in effect from a few months to long term (more than two years) and even permanent replacement. Doctors in our society can help you choose the product that matches the tissue structure at various levels of skin depth. For wrinkle treatment no pain relief is generally necessary but local anesthetic is readily available. The treatments involve a tiny injection amount of gel with a very thin needle producing volume and smoothing the wrinkles. Doctors in our society are very experienced in the Paris Lip Technique being able to define the border of the lips, giving a natural outline. It's received with enthusiasm by younger people who want a high fashion look, as well as by the more mature women seeking a natural, more youthful appearance. This procedure is a safe, controlled and painless procedure using fine crystals to remove dead cells. A revolutionary new way to treat common problems including acne, keloid or acne scars, fine lines and ageing skin. It has the advantage of no downtime with healing within 2 to 3 days and the results are remarkable. These range from the lunchtime Glycolic Acid Peel with no time required off work to the TCA peel which is excellent for removing sun damage and fine wrinkles in the younger woman and takes a week for full recovery. Jessner Peel is an excellent intermediate superficial peel for treating pigmentation, freckles and tired, dull skin. A new procedure is now available that treats a combination of changes in facial skin - these changes are the early and dramatic signs of aging. 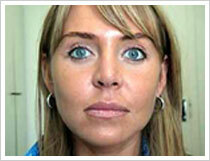 The procedure is called IPL Photo Rejuvenation. Because Intense Pulse Light (IPL™) treats multiple factors that contribute to skin aging, this treatment is ideal for many patients. In addition it is a procedure that fits the lifestyle of active people and it requires no "downtime" - you can resume work or other activities immediately. Traditional hair removal techniques, such as shaving, plucking, waxing and depilatory creams provide only temporary relief. The latest laser hair removal system safely removes unwanted body hair without damaging the delicate pores and structures of the skin. Facial and bikini areas are usually completed in under ten minutes; legs, backs and larger areas can take longer. Both men and children can benefit from this state-of-the-art procedure, depending upon their unique situation. The "Feather-Lift" is a non-surgical approach to facial lifting utilizing the patented "Aptos® threads". What are "Aptos® Threads" ? The Aptos® threads" are made of a monofiliment material called "polypropylene". Aptos® threads are designed with directional cogs. Once inserted under the skin, The Aptos® thread cogs will form a support structure for the tissue of the face. Is it hard to perform ? This procedure is safe, quick and easy to perform. Performed under local anaesthesia and if desired, light IV sedation, the patient remains awake and alert. Using a needle, the Aptos® threads are inserted into the subcutaneous fat, at a required depth, along the contours that were previously marked. Abrasive Needling and Collagen Induction is a relatively new procedure to Australia. Initially introduced by a plastic surgeon in South Africa, it has now been used successfully for 3-4 years. The procedure can be performed in two ways depending on the size of the affected area. 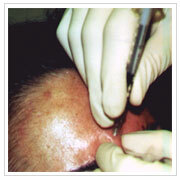 On limited areas such as single wrinkles or scars, the doctor would apply or inject local anaesthetic before abrading the area using a needle. On larger areas, a special roller is required to abrade the area. After anaesthetising the roller is directed over the skin to finely pierce its surface creating multiple pinholes in the epidermis and dermis. This action stimulates the 'fibroblast cells' that are responsible for the production of collagen and elastin deposits within the skin, thus giving the skin its bulk and smoothness. This technique causes visible localised bruising, swelling and an abrasive appearance to the skin's surface. In most cases, these symptoms settle within 5 to 10 days. Immediately after the procedure a special cream and adhesive dressing is applied to the skin. The patient is reviewed the following day to decide if the dressing is to be re-applied or the area left open. Each patient is assessed individually on his or her needs. Make-up and sunscreen may be applied after 5-7 days if the skin is not irritated. Sun exposure should be minimised to protect the skin. Returning to work largely depends on the individual, their occupation and lifestyle. Rarely, infection can occur which can delay the healing process. Subcision is a procedure that is usually used in conjunction with other acne scar treatments. Subcision is beneficial when acne scarring has left 'depressions' or 'divots' in the skin's surface. The procedure involves the insertion of a sharp instrument, usually a needle, under the scarred area which when manoeuvred by the doctor breaks the fibrous tissue that has secured the scarred skin to the underlying tissue. This technique is known as 'undermining' the scar or 'freeing up' the skin surface from the underlying tissue. Bleeding usually occurs during this procedure and is beneficial in assisting to raise the skin and flatten out the scarred skin surface. The depressed or divot areas on the skin's surface appear less deep after this procedure as there is some initial swelling. As the swelling reduces, the degree of up lift will become evident. Subcision is usually performed under local anaesthesia for small areas. 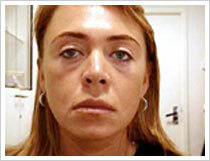 When used in conjunction with other procedures for more extensive scarring, light sedation is usually recommended. Photodynamic Therapy is one of the newer techniques that uses a cream and light to treat sun damaged skin, skin cancers, aging, acne, and sun spots. It is non surgical, non invasive and produces excellent cosmetic results. Photodynamic therapy (PDT) is a treatment for a number of skin conditions such as sun spots, sun damage, aging, acne and skin cancer. During the treatment a cream is applied to the skin for 1 hour and then the skin is exposed to either a Blue light or Pulsed light. The cream is selectively taken up by the abnormal skin compared to surrounding normal skin. The cream is then activated by the light (Blue or Pulsed light) which in turn removes the abnormal cells, and allows normal skin to replace them. What sort of cream is used? A special cream is applied to the skin, which is converted to a porphyrin substance within abnormal calls of the skin. Porphyrin is activated by various light sources leading to the selective removal of abnormal cells. The cream is safe, but it makes your skin sensitive to sunlight for 48 hours after the treatment. Does the cream have side effects? The cream is safe and does not lead to cancer. But it does make people sensitive to sunlight for 48 hours after treatment. This means that it is essential to wear sunscreen strictly for 48 hours after treatment. What sort of light is used? The special cream and porphyrins are activated by many different light and laser sources. We commonly use Pulsed light (IPL) and Blu-U. These are not ultraviolet lights, so do not cause skin cancers. Light sources are not X rays. These light sources do not have harmful effects on the skin. In fact Pulsed light (IPL) is used for skin rejuvenation, and for treating red veins and brown marks. How Effective is Photodynamic Therapy (PDT)? Photodynamic therapy is highly effective in treating sun spots, and some skin cancers with a cure rate of over 90%. In the treatment of sun damage and aging, the cosmetic improvement is significant. Skin texture, colour and fine lines usually are substantially improved, and may disappear completely. 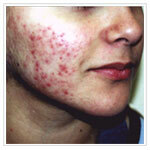 Acne can be successfully treated with monthly treatment of PDT. Even severe cases of acne can be successfully treated. In some patients the results are as good as Roaccutane therapy. During PDT there is some burning discomfort. A cooling fan is used to minimize this discomfort. Does PDT require an anesthetic? No. PDT does not need an anesthetic. No hospitalisation is required. What aftercare is needed after PDT? Regular makeup can be worn immediately after treatment. You may be red and swollen for a few days after treatment. There may also be some peeling of the skin. A few days off work are recommended. Is PDT suitable for all skin colours? PDT can be used in all skin types. Scarring is not usually associated with PDT. Are there side effects with PDT? Sunburn with blisters. PDT makes the skin sensitive to sunlight for 48 hours after the treatment, so sunscreens are essential. What parts of the body can PDT be used on? PDT can be used on all parts of the body, but the face is the commonest site. How does PDT compare to other forms of treatment? Treatment of some skin cancers is close to the cure rate of surgery, but produces a much better cosmetic result. Treatment of acne is as good as conventional treatment in many cases and can produce equivalent results to Ro Accutane in some people. What age groups are suitable for PDT? PDT can be used in all age groups. Mesotherapy is a breakthrough medical treatment that gives patients a non-invasive remedy for cellulite, unwanted fat, wrinkles and aging of the skin, sagging skin, aged hands and excess skin or fat on the neck. It involves micro-injections of vitamins, minerals, complimentary medicines and advanced pharmaceutical preparations into the mesoderm or middle layer of the skin. The procedure was first developed about 50 years ago by Dr Michael Pistor in France, and has been in common use in Europe since then. Until recently, mesotherapy was considered a quirky, somewhat oddball treatment in Australia and the United States. However, a gifted American doctor, Lionel Bissoon, embarked on an exhaustive investigation of the treatment, and his work has legitimised Mesotherapy and standardised many of the formulas used for fat burning and body sculpting. There are now hundreds of Mesotherapy specialists in the USA, many of them trained by Dr Bissoon. Bissoon's work has included clinical investigation of the effects of the main compounds used in Mesotherapy, and comparative trials of different Mesotherapy techniques to achieve optimum results for patients. Mesotherapy's microinjections act as a 'medicinal bullet', delivered directly to its target in your body. Mesotherapy treatments fall into two categories, those that enhance, tone and nourish the skin, and those that stimulate the body to burn fat or dissolve fibrous tissue. The first type of treatment works by providing a patient's skin with various vitamins and minerals, and with stimulants that trigger the production of collagen, elastin and other essentials. The second type of treatment works at a cellular level on the body's fat cells. Those fat cells have two receptors on them, an alpha receptor through which the fat cell receives its fat for storage, and a beta receptor, through which the fat cell excretes fat when the body need additional fuel for burning. The problem is that in different parts of your body, our fat cells have an imbalance of alpha and beta receptors. Typically, in women, the lower down their torso you go, the higher the ratio of alphas to betas... that is, there are more receptors for storing fat, and less receptors for getting rid of it. Mesotherapy acts by stimulating the beta receptors to excrete the fat, and by blocking the alpha receptors so that fat can't go back into the cell. The body then uses up the fatty acids that are excreted by the fat cells in its normal day to day function. Mesotherapy. You will be amazed by the results. ReCell® is an innovative and unique medical device developed by the Director of the Western Australia Burns Service & former Australian of the Year, Clinical Professor Fiona Wood. The device gained TGA approval for use in Australia in May 2006. ReCell® enables skin cells harvested from a small biopsy to be re-introduced into a larger treatment area that requires new cells to promote appropriate healing, skin texture and/or skin colour for indications such as Vitiligo, scar revisions & resurfacing procedures. ReCell® produces a skin cell suspension that contains the cells necessary to promote and accelerate healthy skin growth including not only keratinocytes but also melanocytes which, of course, are pivotal in the reintroduction of colour into pale scars or other areas of hypopigmentation. A small skin biopsy is collected from an area close to the skin site that is to be treated. This may enable the treated area to form the same texture and colour as the surrounding skin. The biopsy is usually around one to two centimetres square and is also treated later with the spray to assist it to heal. Whilst the treatment area is being preparing, the skin sample is placed into the ReCell kit. The ReCell device makes it possible to separate the skin cells, form it into a solution, then spray it onto the desired treatment site within only a 15-20 minute period. This form of "tissue engineering" has only previously been possible with the availability of a fully equipped hospital skin laboratory, making it unavailable to the majority of practitioners and their patients. After the procedure the treated area is covered with a dressing that is removed after about three to five days depending on the patient. If the treatment is to reintroduce pigment (e.g. stable vitiligo), the re-pigmentation will occur slowly over several months as the cells grow, mature and start to produce melanin. The results following surgery with ReCell are highly dependant on the reason for undergoing the treatment, the severity of the infliction and the ability of the patient's body to recuperate after an operation. ReCell is used in trauma to treat small burns, scalds, site specific injuries (e.g. hands / feet) and skin graft donor sites for burns, etc. Reconstructive procedures for scars from surgical wounds, old burns or scalds, acne scars, skin cancers and donor site revisions are also indications. ReCell is also used in stable vitiligo, other stable autoimmune hypopigmentation, sun damaged skin, pale traumatic scars and scars following surgery / cancer removal. In cosmetic surgery ReCell has been used for laser resurfacing, dermabrasion, deep chemical peels, tattoo removal and scar removal.